Hamburger is a context dropdown, usually placed in the top right corner of a form. It usually contains commands and option settings for the user. Its name come from its appearance - a top and a bottom with a filling in the middle. 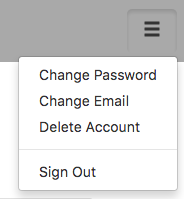 It is virtually identical to the Dropdown (Bootstrap) control - it works the same way, but has different defaults. When the control is created, selection is set to undefined. Two onclick events happen when a Hamburger is clicked. When the control is initially clicked, an event is sent. When the user makes a selection, onclick is called again with the text of the selection. addItem(item, type) Adds an item to the end. type can be "checked", "disabled" or 'divider'. Runtime. appearance Appearance of the alert. Can be success, info, warning, danger. enable([index,]bool) Enables and disables items. Index can be an item or an array of items. If no index supplied, all items are affected. Bool is true or false. Runtime only. length Current number of items. Runtime. selection Get the value of the selection (after an item is selected). Runtime. This page was last edited on 10 March 2019, at 14:37.